The Guardian FMPe30.48G 60 amp rectifier incorporates resonant technology to reduce component stresses, providing increased system reliability and a best-in-class efficiency. The rectifier features a wide input operating voltage range to maximize power availability within demanding utility power environments. 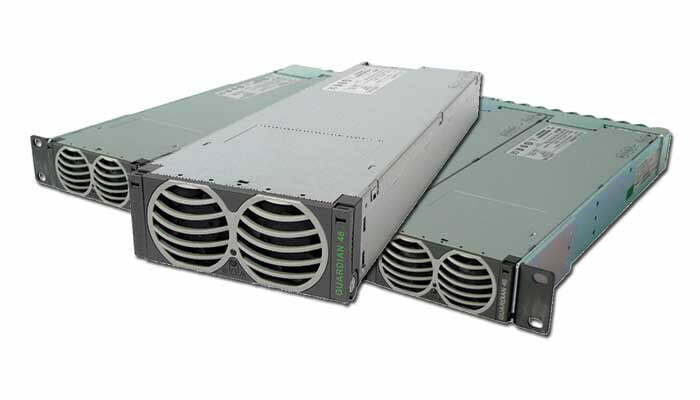 These compact 60 amp rectifiers support up to 14.5kW in a 1RU 23” shelf. A wide variety of distribution options are available to provide the maximum system flexibility for a wide range of communications applications that demand efficiency, reliability, and flexibility including wireless base stations, remote switches, and broadband access. 1. Models shown in italics are other members of the product family. Click on the model number to go to the relevant product page. 2. Ratings are up to the Max. Temp. ambient indicated. See individual product pages or datasheets for deratings at higher temperatures. The absolute maximum ambient temperature is 75°C.